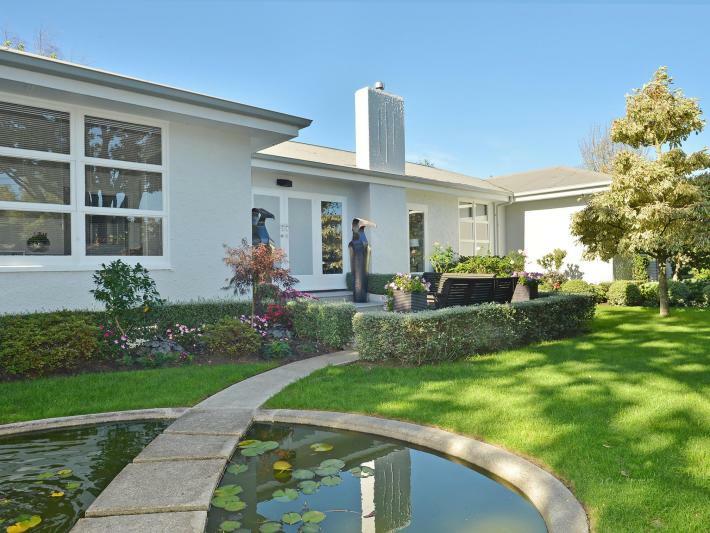 An elegant combination of modern with original, a surprisingly secluded, handsome single-level house of unusual H-shape design in one of Greytown's most sought-after streets. The formal entrance is reached across a tranquil reflecting pool set in a landscaped garden. Well-proportioned rooms are decorated in contemporary tones, with LED lighting setting off the rejuvenated native wooden floors. Excellent indoor-outdoor flow offers the choice between covered and open-air spaces for relaxing or entertaining, overlooking a designer fountain set among lush greenery and flowering trees. The sleek and well-placed custom kitchen combines pizzazz with practicality: quality appliances, soft-close cabinets, and chic splashbacks. The sitting and dining rooms suit both formal and casual entertaining. All three bedrooms are spacious well-separated doubles. One apart, has ensuite and private deck access, the other two bracket a new bathroom and separate lavatory. Radiators in every room except the lavatory, a gas-fire, and an HRV ensure year-round comfort. Fenced and gated on a freehold section, the home will suit professional or retired couples seeking to combine style with convenience. Sure to attract, so be among the first to view.